I had seen a card I really liked on the OWH Memorial Weekend Bloghop where someone had created a wonderful background out of a sentiment and that is where I decided to go with this card. I still have not had time to purchase a new photo card so scanning was the only way to go and because of the brad it looks a little funny...but you get the general idea. I really like the graphic look of this card, so I may make several in the near future. This is cute! Thanks for playing in our Midweek Throwdown challenge at Operation Write Home! ooohhhhh..... I like how the 'YOU' is so big.....makes them know for sure that they are truly missed!!! Awesome card!! ;) Have a great weekend!!! 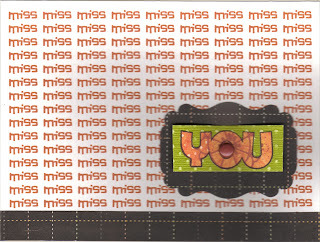 I just LOVE how you stamped the background so perfectly! It looks great with the large "You"! Very creative!! Love the look of this! Great design!